Designed exclusively for La Cafetière® by Alison Appleton. This stylish set is made from grade A melamine and is dishwasher-proof. The strong melamine material means that these cafetières do not easily break if dropped onto a hard surface, so making them suitable for use outside, such as on the patio or by the pool. This is ideal for camping, caravan as no glass to break! 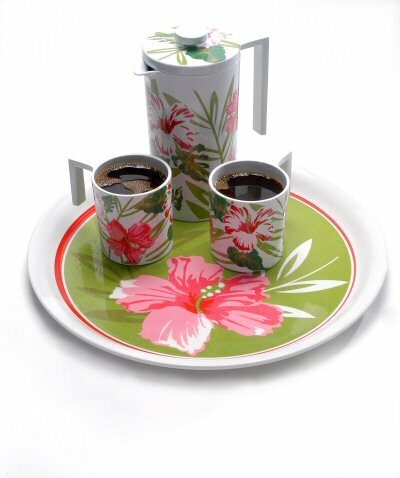 Miami is a gift set, consisting of an 8 Cup cafetiere, 2 cups and an exclusive Melamine tray. Comes in a Gift Box.